The Shoshones, Utes, and Pah-Utes are the principal Indian tribes seen along the railroad from Salt Lake to Stockton. 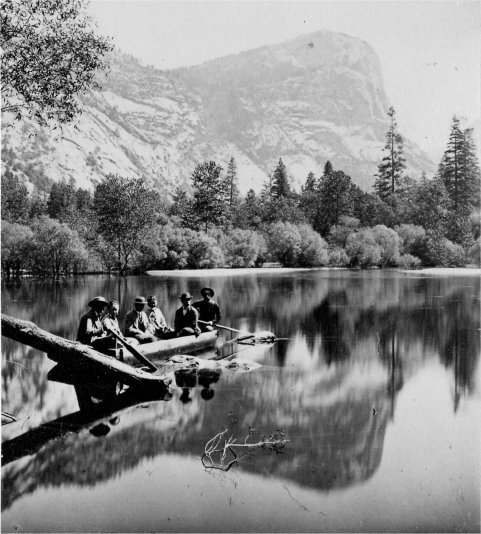 In the Yosemite Valley there are the “Diggers,” so called because, in times of scarcity, they subsist on acorns, roots, and insects and their grubs, dug from the earth. Though low in the scale of man, they are not the abject creatures generally represented; they are mild, harmless, and singularly honest. Of their honesty you can have no doubt when you see in the woods and valleys little storehouses, raised above inundations, and made of bushes, grasses, and stakes, in which their acorns and nuts are stored for the winter; they always respect each other’s property thus arranged, but these repositories have often been broken into and robbed by mischievous and unscrupulous whites. As usual with the American aborigines, they are more sinned against than sinning. They are very dark-colored, fond of gaudy beads and colors, and expert hunters and fishermen; they will catch a string of trout where the Eastern angler, with his flies and costly outfit, cannot get a bite. They are addicted to intemperance, when they can get fire-water; but for this, and the consequent poverty, misery, and disease, the whites are accountable. While we were in the Valley, there was a grand pow-wow one night over the chief, who was supposed to be dying; all sorts of howlings and incantations were practised by his women; but the smell of his breath, his sudden revival at the mention of whiskey, and the fact that he was out fishing, all next day, were sufficient proofs that it was only a fit of delirium tremens. Near Clark’s hotel is an Indian sweat-house, which is an object of curiosity to travellers. It consists of an oval depression in the ground, about eight feet long and two feet deep; over this is a heavily-thatched dome-shaped roof, plastered with mud and leaves; on the mud floor is placed a circle of rounded stones, enclosing a bed of twigs and leaves; a fire is made around the stones, upon which, when highly heated, water is poured, at the same time extinguishing the fire, but raising an abundance of very hot steam; the patient, naked, then lies down upon the inner bed of leaves, and the entrance is nearly closed; after sweating sufficiently, he rushes out and plunges into a branch of the Merced River near by—a primitive but effectual Russian bath. Mirror Lake and Mt. Watkins. natured, strong, industrious, a fine rider, and skilled in all woodcraft. The Mongolian origin of the American Indian has generally been accepted by closet ethnologists; but any one who takes this California trip will be likely to have this opinion, if he entertain it, shaken. Here you see the Indian and the Chinese side by side: except in the general contour of the face and the straight black hair, there is hardly any resemblance in physical character, and their mental characteristics are entirely opposite. The Diggers, and other California Indians, are supposed by some to have come from the west by sea, from the Japanese or Malayan Islands, instead of from the northeast, by way of Greenland, like the Esquimaux. Whatever their origin, they are fast disappearing, as they cannot adopt the civilization of the white race; scorning agriculture and manual labor, they are truly in the hunter state, and in their Stone Age, beyond which they will never progress.